Knitting needles are the latest pieces of kit being put to work by Hull University Teaching Hospitals NHS Trust in order to help care for people with dementia. The unusually named ‘Twiddlemuff’ is a single, knitted tube which is worn on the hands, can be any combination of colours, and is often adorned with buttons, bows, zips and decorations, inside and out. 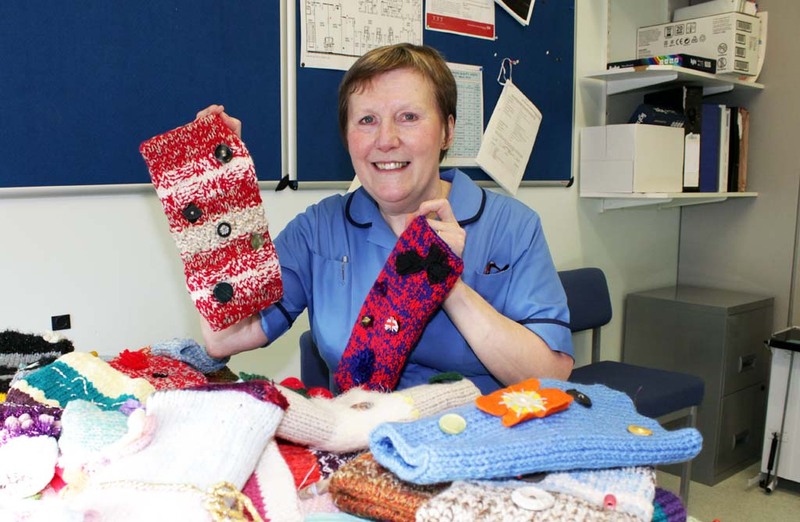 Twiddlemuffs are being given out to people with dementia on both the older people’s wards and the orthopaedic wards at Hull Royal Infirmary, which also care for a high number of elderly patients, as a way of occupying their time and their hands. The first batch of Twiddlemuffs was donated to Hull University Teaching Hospitals NHS Trust by the residents and staff of Goulding Court residential home in Beverley last month. But their needles could barely keep pace with demand, as their brightly coloured creations began to fly out to patients as quickly as they were coming in. “Twiddlemuffs are such a simple idea, and yet they can help to bring a lot of pleasure to people with dementia. It’s well known that people with the condition have memory problems, so whereas you or I could quite happily spend time thinking about the holiday we’ve just had or plan what we’re doing at the weekend, often people with dementia don’t have those thoughts or recollections, so either they don’t do anything, or they look for things to do instead. “I’ve been overwhelmed by the positive response we’ve had to them; everyone pays an interest in them because they’re so bright and colourful, and unusual. “Thanks to the initial donation from Goulding Court, we’ve been able to share the Twiddlemuffs around, get people talking about them, and encourage a few more knitters to get their needles out. We now have some of the nurses’ mums knitting them for us, and we even have a volunteer who usually brings another one or two in each time she comes! More information and details of how to make a basic Twiddlemuff are available here.